(Nanowerk News) Bacteria can swim, propelling themselves through fluids using a whip-like extension called a flaggella. They can also walk, strolling along solid surfaces using little fibrous legs called pili. It is this motility that enable some pathogenic bacteria to establish the infections – such as meningitis – that cause their human hosts to get sick or even die. "When it comes down to it, a single atom makes all the difference," said senior study author Matthew R. Redinbo, Ph.D., professor of chemistry, biochemistry and biophysics at UNC. His findings appear in the Dec. 28, 2009, early online edition of the Proceedings of the National Academy of Sciences. For the last few years, Redinbo and his team has been working in close collaboration with Matthew C. Wolfgang, Ph.D., an assistant professor of microbiology and immunology and a member of the Cystic Fibrosis/Pulmonary Research and Treatment Center at UNC, trying to figure out how bacteria's tiny legs or pili function. The researchers began to look at one of the many types of pili, called type IV pili. Type IV pili are basically long, dense fibers that bacteria assemble (extension) or disassemble (retraction) quite quickly. "These pili act as grappling hooks – the bacteria extend the fibers out, the fibers attach or stick to a surface, and then retracted back into the bacteria, pulling it along," said Wolfgang. "This crawling movement is called twitching motility, and without it Pseudomonas, a common cause of hospital-acquired pneumonia would never be able to move from the lung tissue into the bloodstream, where the infection becomes lethal." The researchers knew that inside the cell lie the tiny little motors – called ATPases – that drive the extension and retraction of the pili. One of these ATPases is the extension motor, which sticks the bacteria's leg out. The other ATPase is the retraction motor, which pulls it back in. But what wasn't clear was how the two motors were coordinated so that pushing and pulling didn't occur at the same time. That is what Redinbo and Wolfgang set out to discover. 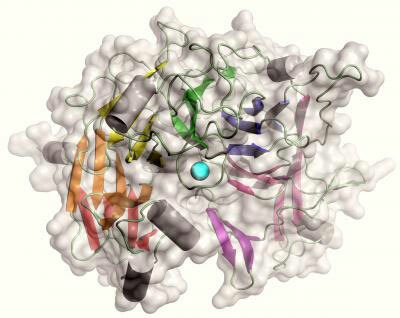 First, they resolved the crystal structure of the Pseudomonas PilY1 protein, which other research had shown was necessary for the creation of pili. They made large amounts of the protein, coaxed it out of solution so that it formed a crystal, and then put the crystal under intense x-ray beams through a process called x-ray diffraction that resulted in a series of spots. Based on the spots, the researchers calculated what the protein looked like. When they studied the structure, one particular site – the binding site of a calcium atom – looked like it could be important for the function of the protein. So the researchers began to tinker with the site, looking to see if the changes they made affected the protein's behavior. When they changed the protein so it could no longer bind calcium, the bacteria couldn't make any legs. When they fooled the protein into thinking it was forever bound to calcium, the bacteria made legs but couldn't retract them, essentially becoming paralyzed. The results suggested that the protein has to bind calcium to make legs, but it also has to be able to let go of the calcium to pull the legs back in. "We found it pretty remarkable that the binding of a single atom to a protein that is outside the cell is sufficient to tell these motors that are inside the cell to either stop pushing or stop pulling," said Redinbo. He says they are currently using a combination of genetics and biochemistry to figure out how this long-distance communication is possible.